Jes Baker is a positive, progressive, and magnificently irreverent force to be reckoned with in the realm of self-love advocacy and mental health. She believes in the importance of body autonomy, TYPING IN ALL CAPS, strong coffee, and even stronger language. Jes is internationally recognized for her writing on her blog, The Militant Baker and for the "Attractive and Fat" campaign. Her extensive body advocacy work has continued to garner attention from hundreds of national and international media networks. When not blogging, Jes spends her time speaking at universities, taking pictures in her underwear, writing for online publications, working with plus size clothing companies, attempting to convince her cats that they like to wear bow ties and trying to beat her best time when playing The Quiet Game. Jes's record is currently a respectable 15 seconds. Learn more about Jes at TheMilitantBaker.com. "Baker is back with a captivating look at her life as a fat girl and how our culture still devalues those whose bodies have been deemed unruly. 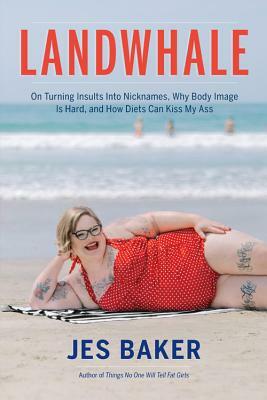 True to form, Landwhale is full of wittiness and a lot of truth." "With the perfect tidal wave of humor and candid emotion, Jes once again shows me how to not only love my own body, but every body around me, as well. It's as if she's written Landwhale about the daily complicated love affair I have in my skin, and I'll never stop reading it. All women, at all stages of their journey, must read this book! "—Brittany Gibbons, New York Times bestselling author of Fat Girl Walking and The Clothes Make the Girl (Look Fat)?